Colorado painter Stephen C. Datz, like most landscape painters, is most at peace in front of the easel and out within nature. For his newest show, opening November I7 at Mark Sublette Medicine Man Gallery in Tucson, Arizona, the artist has painted some of his favorite locations in the United States — scenery that includes destinations in Utah, Colorado, Arizona and other locations in the Southwest. But instead of painting the hits of these destinations, Datz has turned his attention to some notable B-sides. In Ancient Ways, the painter turns his eye to Canyon de Chelly, a popular painting in Northern Arizona known for its tall canyon walls formed into tight S-shaped curves. 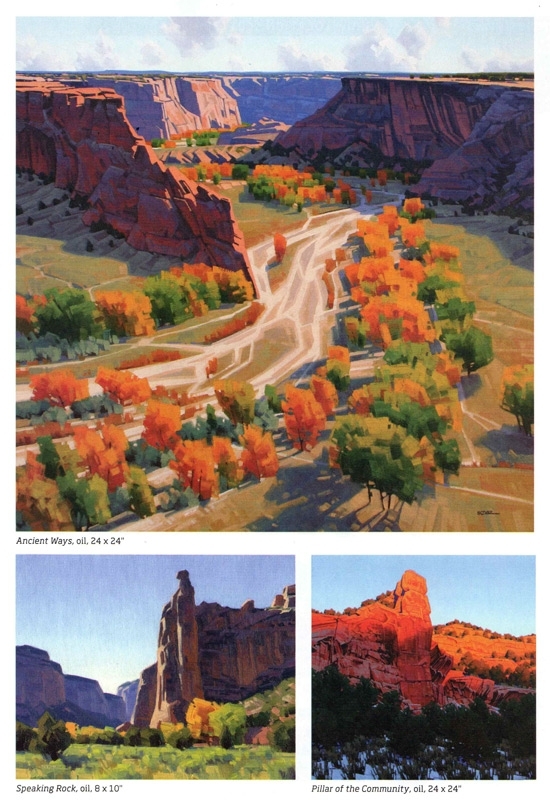 While many artists have focused on these dramatic cliff faces, Datz focuses on the flat canyon floor and a dry creek bed that runs through it alongside trees with autumn leaves. The cliffs can be seen in the image, but as a secondary element that guides the viewers’ eyes through the top of the image.